Presenting our latest soothsaying site layout. This format is your last stride towards a productive, fruitful business. In the event that you run an organization that arrangement with the study of a horoscope subject, this is what Gridgum has for you. A horoscope format that starts from the upper right corner with 6 most regular tabs that highlight the framework of your site. After that comes a little symbol of each of the 12 horoscopes where you can snap to peruse more about. At that point, comes our wonderful slideshow where you ought to put the highlights of your organization and administrations. After that comes our card outline which comes underneath the title "what we offer". It essentially helps you to entirety up various administrations that you offer in your organization. For a horoscope business, we pick it to be close to home horoscopes, wedding horoscope, everyday horoscope and business horoscope. Each joined by the capacity of tapping the "read more" catch. Toward the end we furnish you with the capacity of inviting your visitor, express your central goal and achievement and overhaul your late news. To wrap things up, our site format packs combine 1 month of free host account at www.m9host.com site. Adding that expense to the free pictures that are combined into our plans, we are upbeat to be your smallest exorbitant pathway all through an unfathomable convincing business. 2 pages design in .psd (photoshop) format. All original pages and packages for WordPress installation. 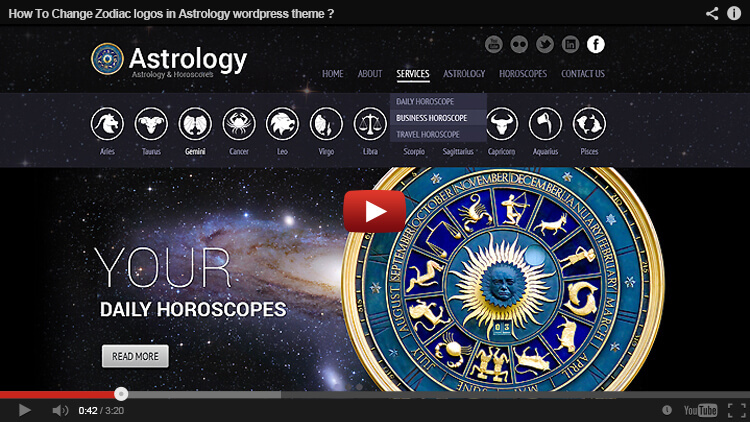 HOW TO INSTALL WORDPRESS ASTROLOGY THEME BY "ALL IN ONE MIGRATION" PLUGIN? HOW TO CHANGE USERNAME OR PASSWORD BY phpMyAdmin? 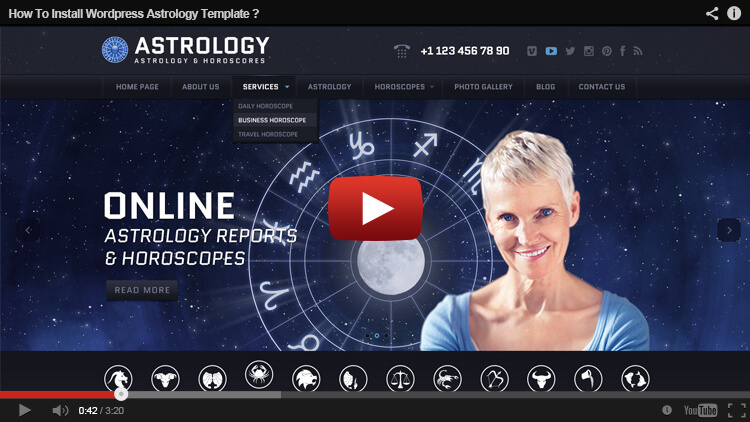 HOW TO CHANGE NAME OF ZODIAC IN ASTROLOGY WORDPRESS THEME? temp-08-250.cimec.ro is currently unable to handle this request. well, in admin it ok. temp-08-250.cimec.ro/wp-admin I sent you in the previous mail credentials, user and password. so in admin is working, with another theme the front side is online. errors in php [19-Apr-2019 23:29:53 Europe/Bucharest] PHP Warning: require_once(D:\Web\WWW\temp-08-250.cimec.ro/wp-load.php): failed to open stream: No such file or directory in D:\Web\WWW\temp-08-250.cimec.ro\wp-blog-header.php on line 13 [19-Apr-2019 23:29:53 Europe/Bucharest] PHP Fatal error: require_once(): Failed opening required 'D:\Web\WWW\temp-08-250.cimec.ro/wp-load.php' (include_path='. ;C:\php\pear') in D:\Web\WWW\temp-08-250.cimec.ro\wp-blog-header.php on line 13 [19-Apr-2019 20:37:07 UTC] PHP Parse error: syntax error, unexpected end of file in D:\Web\WWW\temp-08-250.cimec.ro\wp-content\themes\Astrology\header.php on line 331 support@gridgum.com is working? do you have access to what I send to support? Dear support, Please understand this is online, is on my own server, which I have over 50 online sites is not cpanel, is iis7 but is really online not on my desktop. Dear customer this: D:\ means that template is on your localhost, sorry but we have no access on your local computer, therefore cannot help in this. We asked you to upload template on the server and point us, but nothing from you. In this case, we recommend you to solve the problem with google. yes, it is from php error logs. from server. Have you never had the opportunity to use a Windows Server? Hi And yet there are some problems How is it possible to show the homepage before importing with All-in-One WP Migration but after import do not show the homepage and the error Parse error: syntax error, unexpected end of file in C:\wamp\www\tarotnou\wp-content\themes\Astrology\header.php on line 331 I use WAMPSERVER 3.1.3 32bit, php from 5.6 to 7.1 And at Appearance i have Warning: count(): Parameter must be an array or an object that implements Countable in C:\wamp\www\tarotnou\wp-content\themes\Astrology\admin\options-medialibrary-uploader.php on line 204 Needless to say that the homepage goes with Twenty Fifteen but not with Astrology-template and yes, I saw the video. Hi I do not see my homepage when the template is active. homepage work when using other templates. do you have any idea what to do? do uoy have a technical support mail? doesn't enough only activating theme, you must do many other things also. Please see video tutorials on how to install the template and follow. can you do it for me? how can i contact with you straight ? yes of course, do not worry about this. 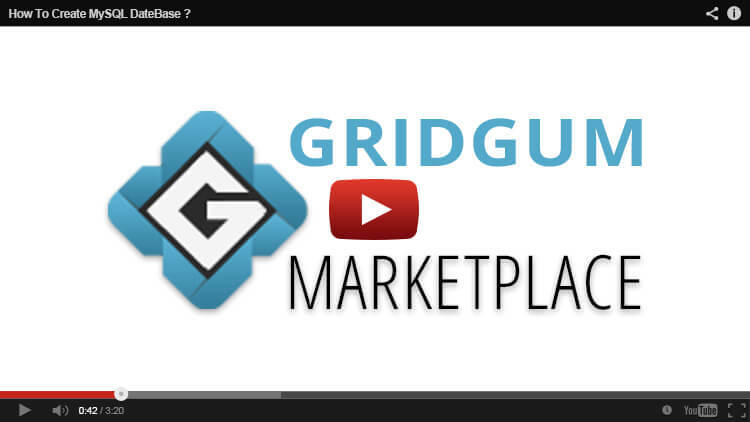 Please send us your host information on this email address: support@gridgum.com, Please send following info: your hosting cPanel address, username, password, your site URL address. Greetings. I just bought the astrology WP theme. The help documentation is regarding a football theme... Can you provide the correct file? Another question if I may: how do I install the theme from WP without the install php script? Cheers, Gulsen Kayikci. 4th (standard installation 3rd step) video tutorials and follow. These video guides is better then any Documentation. Documentation which you found in your template package is standard wordpress documentation for any WordPress themes, but video tutorials are special for this theme. SEE and Follow. If you need help with installation, please let us know and we will do it for you. "try to change each zodiac date" - i have not this option in zodiac category list. Currently sorts them in alphabetical order. There is no sorting and rearrangement option :( Where can I attach a photo to show it? Thanks.